Most people think that corals are found in warm water and that mountains are only on land. 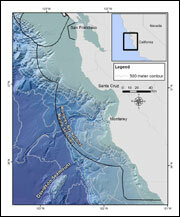 In 2002, scientists from the Monterey Bay National Marine Sanctuary and collaborating institutions were able to use new technologies to explore the cold waters, 4,101 to 11,581 feet deep (1250 to 3530 meters), off the Central California coastline. Their destination, the Davidson Seamount, was covered with spectacular organisms, including large and ancient coral gardens. Scientists found that the corals are mostly located on seamount ridges, they are long-lived, and that there is still much to learn about the taxonomy (scientific names) of these species. 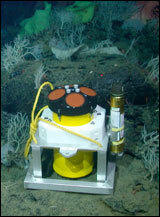 In January 2006, with still 99.98 % of the seamount unexplored, scientists returned to Davidson Seamount for a 10-day research cruise using the remotely operated vehicle Tiburon. The collaborating institutions on the 2006 research cruise were the Monterey Bay National Marine Sanctuary, the Monterey Bay Aquarium Research Institute (MBARI), Moss Landing Marine Laboratories, the British Broadcasting Corporation (BBC), and NOAA's Office of Ocean Exploration. 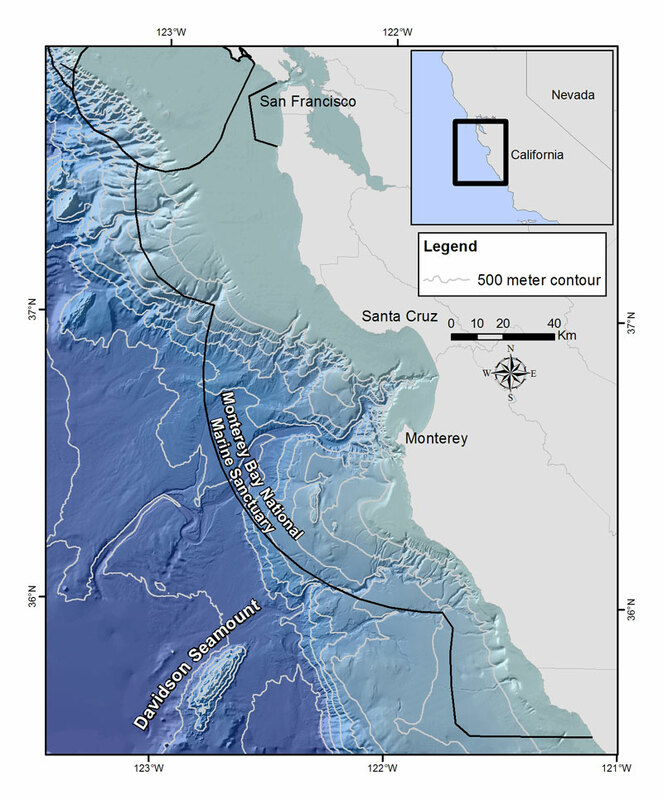 Davidson Seamount is located 120 kilometers (75 miles) to the southwest of Monterey, California (35° 43' 23''N, 122° 43' 23'' W), and is one of the largest seamounts along the Western United States. It is 42 kilometers (26 miles) long, and 13 kilometers (8 miles) wide. From base to crest, Davidson Seamount is 2,280 meters (7,480 feet) tall; yet, it is still 1,250 meters (4,101 feet) below the sea surface. Davidson Seamount has an atypical seamount shape, having northeast-trending ridges created by a type of volcanic activity only recently described by scientists at MBARI. It last erupted about 9.8 million years ago, and this large geographic feature was the first to be characterized as a "seamount." Seamounts are an important habitat for deep-sea corals, and demonstrate a high degree of endemism (species living on a particular seamount and nowhere else). While a full analysis has yet to be completed, the at-sea portion of the cruise was clearly successful. During the 10-day research cruise, 70 hours of observations were made on the Davidson Seamount and 102 deep-sea animal and rock specimens were collected (some species likely new to science). Measurements of water currents and particulates (food) were collected to understand what causes corals to thrive in some areas, but not others. There is now increased knowledge on the patchy distribution of deep-sea corals, and the role of sediments and currents on their distribution. Corals were photographed and collected to determine if new species were found, and to determine age and growth patterns. The BBC was able to obtain spectacular high-definition video of seamount life so you can join in on the fascination of deep-sea life on an upcoming broadcast of Planet Earth. The entire science crew contributed information and daily cruise logs on two web sites (NOAA's Ocean Explorer and MBARI's Cruise into the Classroom) to exchange information and ideas with the public. In terms of resource protection, all scientists left the seamount in awe of the spectacular nature and fragility of deep-sea corals. They will map the location of all deep-sea corals found in and around the Monterey Bay National Marine Sanctuary, and use the new knowledge to develop a map of potential coral habitats where they have not visited yet. Managers will be able to use this information to focus activities such as cable laying in areas where corals are not expected. Marine reserves, including no-take areas, are currently being selected in central California, and these coral maps will also help inform where critical protection areas are. Thanks to the crew of the R/V Western Flyer, ROV Tiburon pilots, and the entire science team. This project was funded by NOAA's Office of Ocean Exploration, the British Broadcasting Corporation, and the Monterey Bay Aquarium Research Institute.